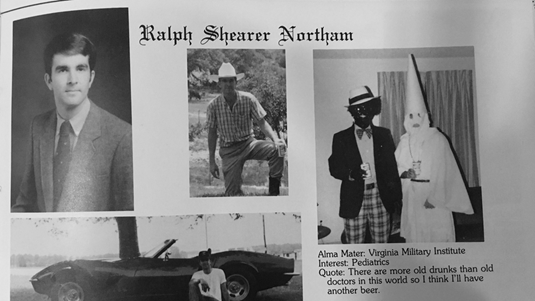 The medical school year book page for Virginia Governor Ralph Northam. but he drove a Corvette. Okay, first off, I agree that Virginia Governor Northam of Virginia should resign. I realize that, now, he’s claiming he isn’t in the racist picture from his college yearbook. Yet, he admitted to some questionable actions from that era: using shoe polish to look like Michael Jackson, as he competed in a dance contest? ► What was the yearbook staff thinking? That’s a bit much. For that matter, there’s simply the fact that his yearbook has such a reprehensible photograph in it. What were these people thinking? Did no one, associated with the yearbook staff or any of the students that bought a copy, think anything was amiss? What of the medical school Northam attended, did no one connected with the administration see the book? Did no one question the insanity of the decision to publish that photograph? I will say this in defense of Northam. His actions over the last several decades have been fair and reasonable. He has not carried out any sort of inappropriate agenda against any member of a minority. That stands in stark contrast to Donald Trump and Senator Cindy Hyde-Smith, to name only two obviously racist politicians. I have to wonder about the double standard at work here. Let’s review, shall we? For literally decades, Trump discriminated against Blacks and other minorities in his rental properties. The New York Times recently reported this fact. Eventually, the federal government charged the Trump Organization for discriminatory rental practices. The case dragged on for years, but the Justice Department didn’t let up. Trump finally settled, paid a fine. Now, he goes around claiming total vindication. That’s a lie, of course. What’s worse is that no one ever calls him on it, why? He called the White Supremacists, in Charlottesville, good people. Let’s not forget perhaps the biggest lie: being a birther for eight years of the Obama presidency. Does anyone remember what he said in one interview? He claimed his detectives were in Hawaii and that we wouldn’t believe what they’d found out. Of course, he couldn’t say what it was then; he was going to wait until the detectives finished their work and then hold a big press conference to reveal the whole story. I don’t recall a follow up to the birther issue, let alone a press conference, although Trump, unexpectedly, dismissed the issue during the presidential campaign. Still, it was racism, pure and simple. Yet, he gets a total pass on it, why? Then there’s Senator Hyde-Smith of the state of Mississippi. Appointed by the governor to finish out the term of a retiring senator term and then elected on her own after she joked about lynchings, photographed in Confederate clothes and praised the Confederacy. No questioning of her racial views and, again, I ask, why? Trump and Hyde-Smith are only two members of the party. Too many Republicans are openly racist. They openly make disparaging remarks about Blacks, Hispanics, Asians, women, members of the LGBTQI community and just about any other group they hate. How often has Ted Nugent made vile comments about President Obama, the Clintons and anyone he disagrees with? Roy Moore almost won an election. Ted Cruz recently defended a man who blamed women for their own sexual assaults. Oh, and have we forgotten Justice Kavanaugh and the allegations against him? ► Republicans get away with the worst actions. Why do republicans consistently get a free pass on these issues? I’m not suggesting we let Northam off the hook for his actions. I’m merely calling for an end to this double standard. It does seem that all it takes is a single charge against a democrat to end their career, but a Republican can say and do anything they want and it is completely and acceptable. Makes me wonder is this so.